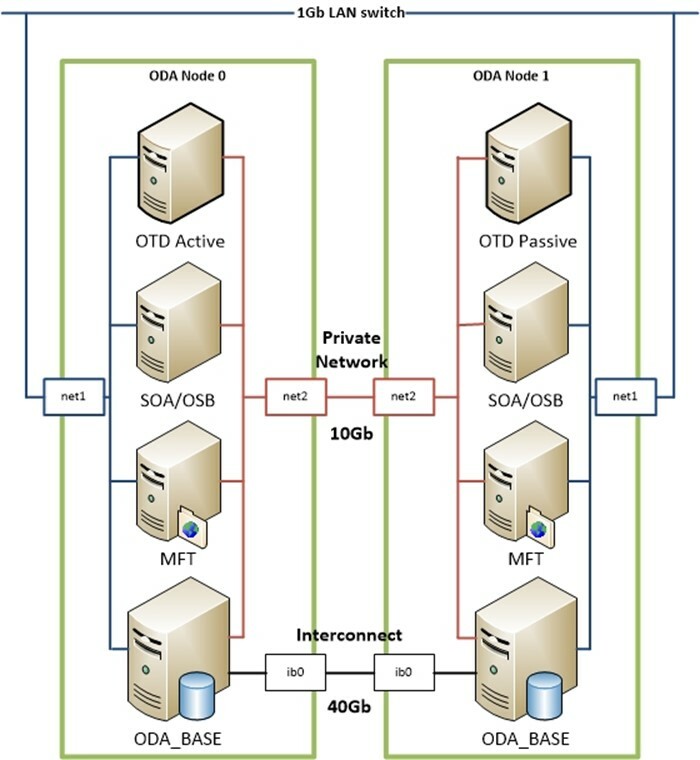 In my previous post Network considerations on an ODA X5-2 I described a solution where I created a private network to optimize network performance between the components running on an Oracle Database Appliance. 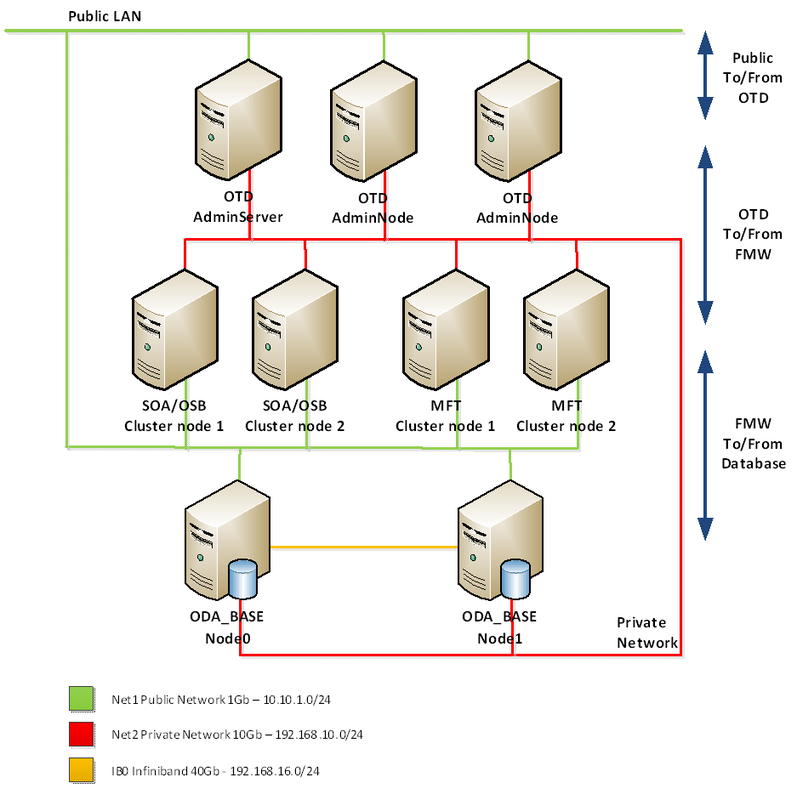 I am talking about a Virtualized setup in this article, and rebuilding the second pair of public interfaces to become a private network bond, in order to get a faster connection between the virtual machines. In this article I will describe the steps how to create a private network on an ODA X5-2 and configure an additional SCAN-listener for this private network. Let’s start by connecting the two nodes of the ODA directly to each other using Cat. 6 Ethernet cables. Make sure that the cables are long enough to route them through the Cable Management Arm. This way you don’t have to disconnect the cables when you have to do maintenance on the nodes. We will use the second pair of interfaces for the configuration of the private network. Connect interfaces net2 and net3 on node0 to net2 and net3 on node1. This will create a 10 Gb network between the two nodes. Now actually, you have a private network configured that you can assign to the VM’s. In Dom0 the pair of interfaces is known as net2 and is assigned to the ODA_BASE. Within the ODA_BASE the interface is known as eth1. In this example we will use subnet 192.168.10.0/24 for the private network. There are several ways to assign an IP addresses to eth1 on the ODA_BASE on both nodes. If you are preparing for Oracle Database Appliance Installation and Deployment you configure the interface and ip-address during the deployment. 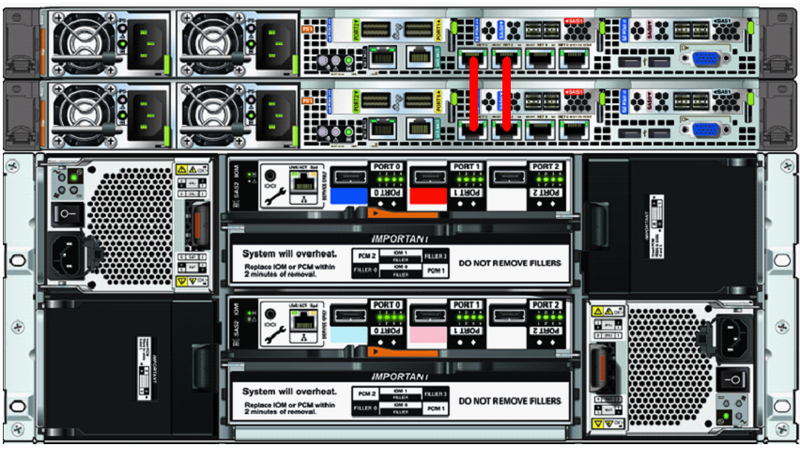 The Oracle Appliance Manager Configurator will guide you through the process. If eth1 is unconfigured, you can use oakcli on the ODA_BASE of both nodes to configure it. Note. Don’t change the primary public IP addresses this way!!! ODA: How to Change Oracle Database Appliance IP Addresses Post Deployment (Doc ID 1504734.1) on Oracle support. If eth1 is already configured and you want to give it another IP address we can edit the ifcfg-eth1 file on the ODA_BASE of both nodes. The next time the ODA_BASE is restarted, the interface will start automatically with the new address. Note that the eth1 interface on the ODA_BASE is also known as net2 on the Dom0 and in the GRID infrastructure. Continuing this article I will use the term net2 for the private network. When an ODA is installed and deployed, the Oracle Appliance Manager Configurator configures the SCAN listener on the interface defined as firstnet. Usually this will be net1. Now that we have a private network, we wat to be able to use it for connections to the database. So we are going to add a SCAN listener to net2. After initial deployment, the /etc/hosts file is filled with default values. For example. # Below are SCAN IP addresses for reference. Where 10.10.1.0/24 is the subnet for net1 in this example. Add the VIP hostnames of the newly created private network on net2. To make things easy, used the same hostname as the public hostname and added -int to it. Also add the vip addess of the SCAN listener to DNS before you create the new SCAN listener. On an ODA by default there are two ip addresses registered for the SCAN listener, so for the new SCAN listener we will also register two addresses on the private interface. In normal circumstances the databases should register themselves to the new listener. I have seen this working on an ODA X5-2 running version 12.1.2.4.0. So normally you are done with the database part. Unfortunately version 12.1.2.6.0 introduced a bug which prevents the registration of the database with the new listener. Unfortunately the fix for this bug didn’t make it to the next release, nor the patchset of version 12.1.2.7.0. DO NOT try to install the normal server patchset Patch 19884033!! I have tried this and almost ruined our ODA installation. Please wait for a patch specifically for the ODA. Waiting for the bugfix, Oracle support supplied the following workaround. I am still working with Oracle support to get a one-off patch for this issue. To use the private network, just add another network adapter to the vm or vmtemplate. oakcli configure vm &lt;vm name&gt; -network "['type=netfront,bridge=net1','type=netfront,bridge=net2']"
oakcli configure vmtemplate &lt;vm template name&gt; -network "['type=netfront,bridge=net1','type=netfront,bridge=net2']"
Let’s take a look at the pictures I used in the previous blog, which are part of the design as an example. In this design I configured the Oracle Traffic Director (OTD) and Fusion Middleware (in this case SOA Suite and MFT) VM’s with two interfaces. The OTD is configured to listen on the public interface and routes traffic to the FMW components on the private interface. The FMW components are configured to listen only on the private network. That way all traffic to the FMW components have to come from the OTD. Also all cluster communication between the FMW components is routed through the private interface. The FMW components route database traffic to and from the ODA_BASE through the private interface. Note. The public interface on the FMW VM’s is only used for SSH. By creating a private network on an ODA, you are not only able to improve performance. You are also capable of separating traffic from public to private. This creates a real one-box solution and, if implemented correctly, increases security. You are able to hide the back-end systems from the clients. At customer sites where I have implemented the private network, they are very pleased with the solution.